In Egypt, mass slaughter of the country's 300,000 pigs is slowly beginning. The action was first announced as a security measure "to reduce the risk of a major swine flu outbreak in Egypt". On May 29th, faced with criticism from health experts and the UN's Food and Agriculture Organisation, who pointed out that pigs actually do not carry the swine flu virus, Egyptian officials changed track and said that the cull was more a general health measure than a specific reaction to swine flu. They promised that "cleaner, larger pig farms would be established outside population centres". The decision has caused an uproar in Egypt. Egypt's pigs are raised by members of the Coptic Christian minority, garbage collectors in the Cairo slums, who feed them food scraps they collect on their rounds. 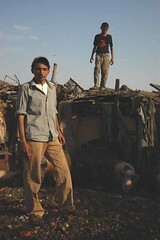 Culling the pigs would severely threaten their livelihoods. According to the NY Times, "It remains unclear if the government will compensate the farmers for their losses. The Health Ministry originally said the farmers would be paid, but after many in Parliament disagreed, the ministry appeared to back down." Journalist Per Björklund has written about the situation in his blog. "Actually, no one I spoke to brought up this issue or portrayed the decision to slaughter the pigs as an attack on christians as a religious group. Instead, one of them offered another theory concerning the motives: 'This is nothing new. Some people have been propagating against the pig farms for a long time. The reason is that there is influential people who want our land, to build expensive apartments. They take this opportunity to get rid of us once and for all.'" DSC_0007_s, originally uploaded by Per Bjorklund. He has some more photos from the Cairo neighbourhood he visited. Animal rights activist Brigitte Bardot has written a letter to Egyptian president Hosni Mubarak protesting the decision: “Taking advantage of the global hysteria over the propagation of ’Mexican’ flu, which has nothing to do with animals, in order to launch a campaign to exterminate pigs raised by a destitute section of the population is extremely cowardly." She also urged the authorities not to proceed with their stated intention to set up what one agriculture ministry official called “new farms in special areas, like in Europe." Ms Bardot called such facilities “horrific and shameful". “To want to kill all these animals and then later establish intensive piggeries where they will be packed tightly together and badly treated is unacceptable,” she wrote, urging Mr Mubarak to prevent the swine slaugher. I am writing to you concerning the Egyptian government's decison to go through with mass killings of pigs. I agree with Ms. Brigitte Bardot, who wrote to President Mubarak recently: The way the Egyptian government is taking advantage of the global hysteria over the propagation of ’Mexican’ flu, which has nothing to do with animals, in order to launch a campaign to exterminate pigs raised by a destitute section of the population, is extremely cowardly. As for the stated intention to set up “new pig farms in special areas, like in Europe", as a European who knows in what terrible conditions pigs are raised in our factory farms, I must say that such facilities are horrific and shameful. To want to kill all these animals and then later establish intensive piggeries where they will be packed tightly together and badly treated is unacceptable. Please reconsider and prevent the mass slaugher of the pigs.